Coffee. A little bit of heart and a lot of hope in Jesus Christ. 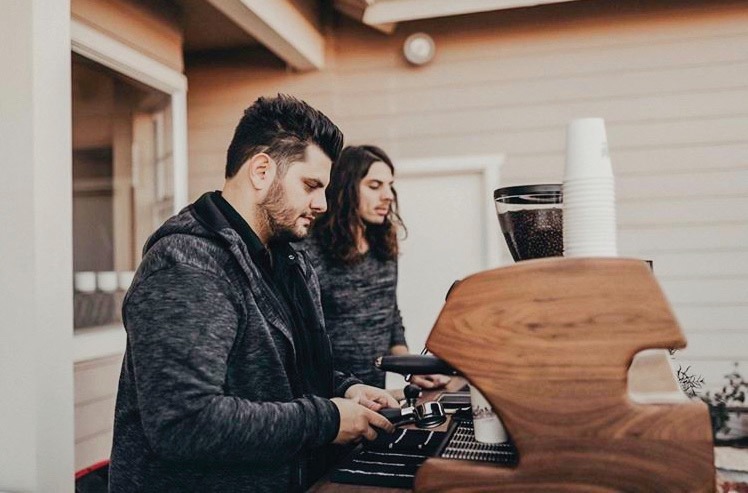 These are the essential ingredients that brothers Danny and Bobby Perde, senior applied theology major at California Baptist University, use in every cup of coffee they make at Brüders — their Yucaipa-based coffee company. For Danny and Bobby Perde, coffee began as a morning ritual to help them wake up, but they knew they had to start roasting and brewing their own coffee after tasting coffee at Augie’s Coffee Co. in Redlands, Calif. After roasting and brewing their own coffee, they said they felt they wanted to start a coffee business but did not know where to start. One late night, the Perde brothers were chatting about an enormous lottery that was being advertised as having a prize of nearly $1 billion. The Perde brothers bounced ideas around for a business name, but it was Bobby Perde who came up with Brüders. Despite not winning the lottery, the Perdes were still motivated to make their dreams come true, and thus, Brüders was born. Brüders started roasting coffee to sell. The brothers had a dream of converting a Volkswagen Bus into a mobile coffee station. They wanted to help people who picked coffee beans in South America by establishing housing and clean water for them with money made from selling coffee. It was a dream-big, make-it-happen plan, but their plans came to a standstill in July 2014 when Danny Perde’s son, Jude, was born. “The doctor came up to me and said, ‘I have good news and bad news. The bad news is that he might not make it past 24 hours. The good news is that we have medicine we can give him that will keep him going for a couple of months until he’s able to undergo surgery,’” Danny Perde said. Jude was born with hypo-plastic right heart syndrome, which results in the underdevelopment of the right atrium and ventricle of the heart. Now, Jude is a happy and healthy 5-year-old. But from his birth came a new reason for Brüders to help those closer to them. So with a new appreciation on life, the brothers resorted to building a simple, rectangular coffee cart instead of a Volkswagen Bus and began scheduling events at which to serve coffee. They pledged 10 percent of their profits to non-profit organizations, such as the Make-A-Wish Foundation. Since 2016, Brüders serves local churches, such as Citizens Church in Redlands, caters weddings and continues to donate 10 percent of its profits to organizations that help children in need. “I have learned that Brüders is a vessel, a vessel for spreading our message, and that message is hope,” Bobby Perde said. More about Brüders can be found on Instagram at @bruderscoffee and charges $5 per person with unlimited coffee for events.